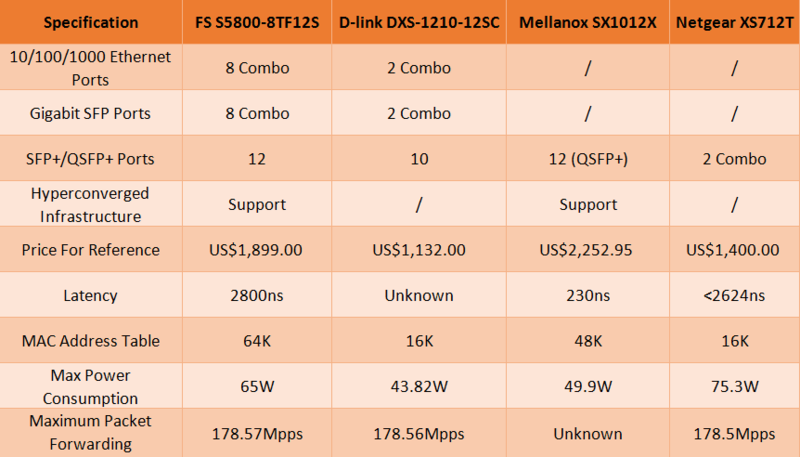 The S5800-8TF12S 12-port 10 GbE SFP+ switch provided by FS.COM can meet all the demands mentioned above. This switch is a high-performance Ethernet switch with several highlights. It offers 8 x 1GbE SFP/RJ45 combo ports and 12 x 10GbE uplink ports in a compact 1RU form factor, which is ideal for hyper-converged infrastructure. In addition, this 10G switch supports both L2 and L3 packet processing. It has very low system power consumption of 65W at most. D-link DXS-1210-12SC is also a 12-port 10G switch. However, it can not meet all the demands mentioned from the three threads. This 10GB SFP+ switch only has 2 x 10GBASE-T/SFP+ combo ports. While, it has 10 x 10-Gigabit SFP+ Ports. It supports auto surveillance VLAN, L2 and L3 packet processing as well. Mellanox SX1012X is an ideal 10GbE ToR switch with 12 ports. It is a high-performance small-scale switch in a half-width 1U form factor. It has 12 QSFP+ ports for uplink connection. If you buy this switch, you have to buy the corresponding DACs and optical modules together since it does not have other port for simple copper connection. The Netgear XS712T is a 12-port 10-Gigabit copper smart switch with 10 dedicated 10GBase-T copper ports and 2 copper/SFP+ combo ports. 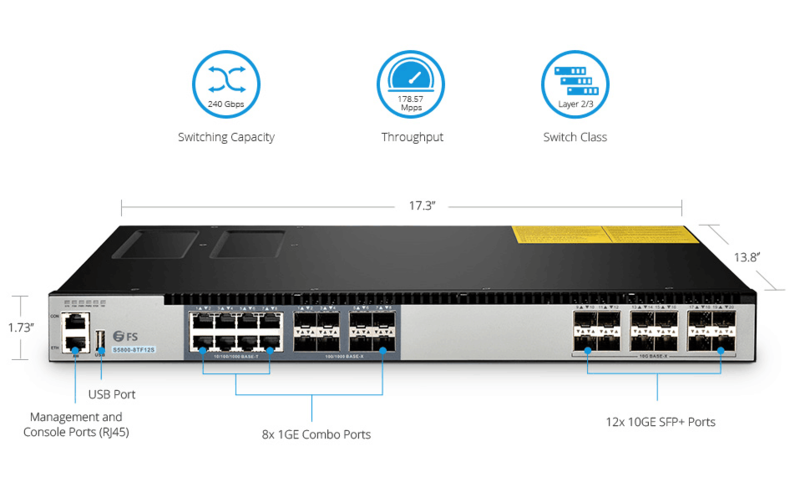 The 10GBase-T copper ports can support 10G/1G/100M speeds and the combo ports are used for 10G connection. It is designed for SMB network with advanced L2+/Layer 3 lite features. From the comparison chart, it is clear that the biggest differences between these 10GbE SFP+ switches are the port types and numbers they support. You can choose a switch according to your actual needs. Of course, the price is another big factor which may affect your decision. For the four 10GbE SFP+ switches recommended above, you can choose from the ports and the functions you need. For example, if you need the switch for hyper-converged infrastructure with 12 x 10 Gbps SFP+ ports, the FS S5800-8TF12S is a better choice. By the way, this switch offers a competitive price of US$ 1,899.00. This entry was posted in Data Center Switch, Network Switches and tagged 10G switch, 10Gb SFP+ Switch, 10gbe sfp switch, 10GbE switch on November 30, 2018 by Fracy.Yin.